3D is nothing new. 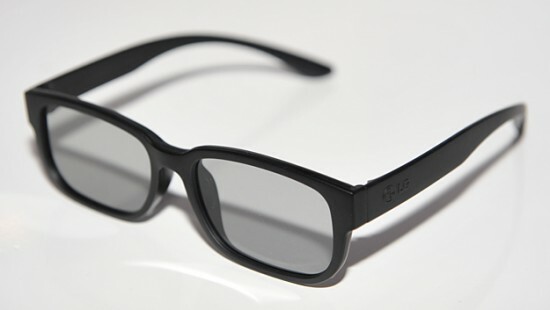 3D films were prominently featured in the 1950s in American cinema, and later experienced a worldwide resurgence in the 1980s and ’90s. The Technology was not the same as we have today. Most of us remember black and white movies with red and blue glasses, those that don’t remember make me feel old. 3D technology has grown in leaps and bounds since then. 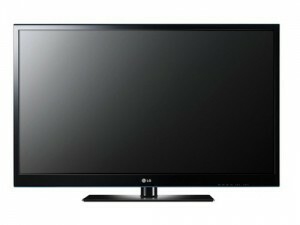 Not just in theathers but at home as well, LG is on point with there “Cinema 3D” TVs. It uses the same inexpensive polorized glasses used in the movie theathers, not those very expensive inefficent battery powered shutter glasses other TV makers use. •The LG 65LW6500 got all the latest technologies that were introduced on the CES 2011 event, including the Cinema 3D technology and the LED-plus technology. No More Free Mobile Web. A few of the nation’s biggest wireless carriers have wised up. They are putting a stop to apps that let Google Android users tether their smartphones for use as modems without paying the carriers’ extra fee. Free Android phone tethering apps that are typically found in the Android Market are not available for Android phones on AT&T, Verizon Wireless, and T-Mobile USA. Sprint customers apparently are still able to access many of these tethering apps from the Android Market. AT&T and Verizon have said that Google chooses which apps are in the Android Market. Neither company would comment on whether they asked Google to remove the Wireless Tether app or any other free tethering app from the Android Market. However a Google spokesman told Fierce Wireless that it is not blocking the app. Instead it’s simply making it unavailable for download on certain carrier networks at the request of those carriers. In essence, the apps are still on the Google Market, but they are just not visible to users on certain carrier networks. Apps are only hidden from view on certain carriers. If your sly enough you can you can still side-loaded these apps onto the device. If the developer distributes the application file in a way other than the Android Market (say, just as a download from a Web site) a user can install that on his device. AT&T has been sending e-mails warning users who are tethering their phones without paying the extra fee. AT&T charges $20 extra per month for the tethering feature. Customers who tether are given 4GB of data to use during the month. Customers who exceed that limit are charged $10 a gigabyte thereafter. T-Mobile USA has the best value at $15 a month in addition to a smartphone data plan for 5GB worth of data per month. And Verizon Wireless charges $20 a month on top of its $30 smartphone data fee to use up to 2GB of data per month. Sony Entering the Tablet Wars. Sony made it official today in Tokyo, disclosing two new tablet designs that will run Android 3.0 “Honeycomb” software and have access to PlayStation content. The Japanese language caption says the images are not final products. It is “developing two tablets,” including the S1 which is “optimized for media entertainment” and the S2, aimed at “mobile communication and entertainment.” The tablets, with the official moniker of “Sony Tablet,” will become available worldwide starting in the fall. The S1 has a 9.4-inch display, while the S2 has two 5.5-inch displays that can be “folded,” Sony said. The screens on the S2 can be used together as one large screen to browse websites, or separately–for example, checking email on one and using the other as a soft keyboard. Both tablets will be equipped with the Android 3.0 operating system and be WiFi and WAN (3G/4G) compatible. Sony will also offer access to content via its Qriocity music and movie services and the PlayStation Suite, a framework for downloading and buying PlayStation content on Android tablets. And e-book content will be available from the Sony Reader Store. Apple’s iPad 2 is thinner, lighter, and faster than the original, but is it different enough from last year’s model to entice new customers? That’s the big question. 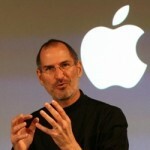 Apple sold more than 15 million iPads in 2010. But, when Apple introduced the new iPad 2, some people are disappointed that latest version was still missing key features and isn’t much different from its predecessor. The device goes on sale in the U.S. on March 11. Is there enough change to warrant an upgrade? 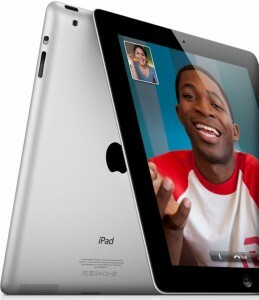 What if your a new customer is the IPad 2 worth the money or do I save $100 and buy the newly reduced price Ipad? I’ll admit, I am torn. Do you use Adobe products? If you use PDF files or view Flash videos, there’s a very good chance you do. Adobe Reader is a very popular PDF reader that is heavily used because it is created by the same company that created PDF files. Whenever a site distributes a PDF file, there’s usually going to be some button that prompts you do download Adobe Reader if you are having trouble viewing the file. The problem is that because of the product’s popularity, it is frequently the target for hackers. 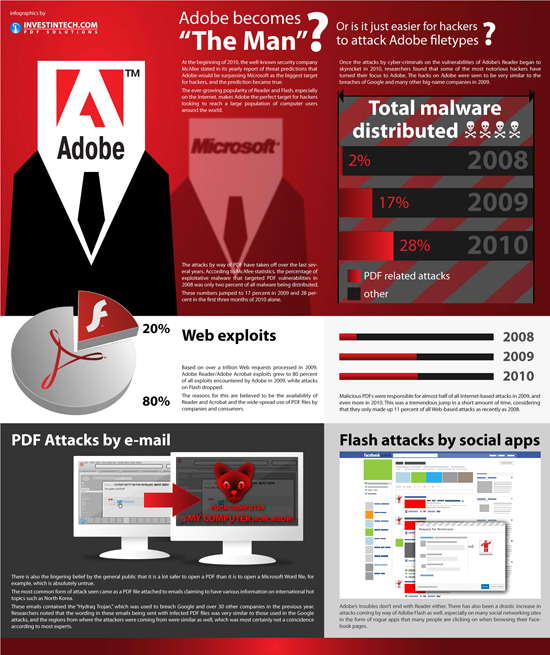 Here’s an interesting infographic I stumbled upon today on Twitter about the rapid increase in security exploits involving PDF files and Adobe. Click to view enlarged version. Remember that Adobe Reader is hardly the only PDF reader out there. There are many alternatives that have far less security vulnerabilities (and not to mention less bloat) including Nitro Reader and SlimPDF. 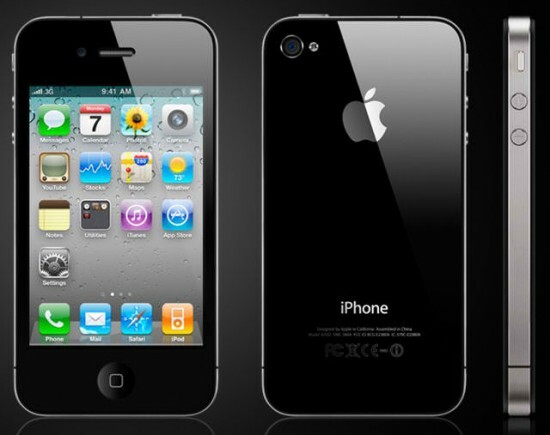 Don’t Let Apple SCREW Your iPhone! According to iFixit CEO, Kyle Wiens, Apple is now using a tamper-resistant screw on its products, including iPhones and laptops. Now what does this mean to you? It means it will become more difficult to repair your Apple products on your own. Apple is switching to a new “Pentalobe” screw to prevent owners from opening up their Apple products. But how does this new “Pentalobe” screw prevent you from repairing your Apple products? Well because the “Pentalobe” screws are fairly new, this usually means the repair tools are both rare and harder to obtain, unlike your every day flat head or Phillips screw drivers. Check out the image below to see how the Pentalobe screw compares to the Phillips screw and others. Now down to the getting screwed part. Apple’s newest policy will certainly piss off a few people. If you now take your iPhone 4 into an Apple Store for any kind of service, the employees are now instructed to replace your previous Phillips screws with the new tamper-resistant screws. If you don’t have an iPhone 4 at the moment but are thinking aout buying one in the future, there is a good chance it will have the new type of screws as Apple has switched production to use these new pieces. Other Apple products currently use these new screws but not all, expect that to change within the near future. What to do if you get screwed? Some aftermarket companies have already created their own kits to solve this problem. iFixit now sells an “iPhone Liberation Kit” which includes a Pentalobe driver, a regular #00 Phillips screwdriver and two replacement Phillips screws. So if you take your iPhone or laptop in, keep an eye on your screws and don’t get screwed! 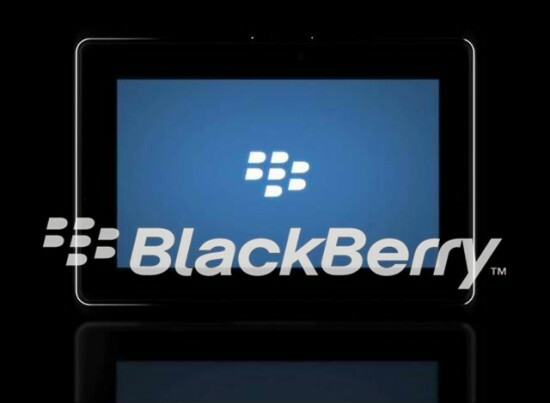 RIM’s has called out Apple’s tablet, saying only that its upcoming PlayBook slate would have “equal or greater” battery life/endurance to Apple’s device. Canadian company’s senior business marketing VP Jeff McDowell is saying this will also be achived using a smaller cell size. The latter part isn’t hard to achieve, considering Apple filled most of its slate’s innards with Li-Pol juice packs, but the promise of matching its autonomy from the wall socket is a big claim to make. Many people consider that to be among the iPad’s foremost strengths, so RIM is surely aiming high by pledging to not only match it, but potentially better it. The PlayBook we saw in person wasn’t quite up to that level yet, but there’s still time until that March launch for RIM to turn bold words into a beautiful reality. McIntosh Laboratory has long been a global leader in home entertainment and offering time-honored McIntosh craftsmanship, incomparable aesthetics and audio superiority. McIntosh Laboratory has defined the highest quality in sound reproduction for 60 years and offers the company’s first-ever standalone integrated audio system – 60th Anniversary MXA60 Integrated Audio System (US MSRP: $7,500). 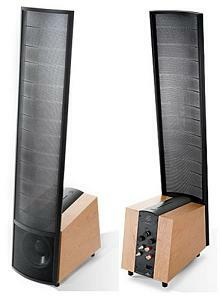 The MXA60 Integrated Audio System was designed by the same team of renowned McIntosh engineers who created the company’s high performance Reference System. 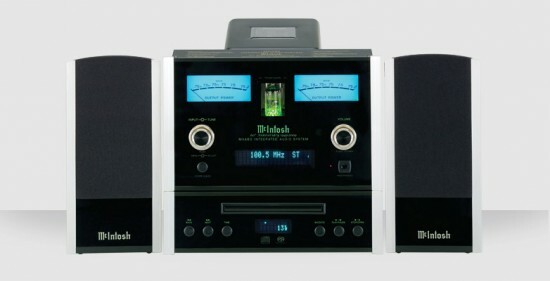 The new ultimate-quality tabletop system features a high-performance 75-watt-per-channel amplifier, state-of-the-art CD/SACD/MP3 player, vacuum tube preamplifier, as well as an AM/FM/RBDS Tuner and high performance, two-way bass reflex loudspeaker system that packs all the legendary McIntosh sound into a smaller package.